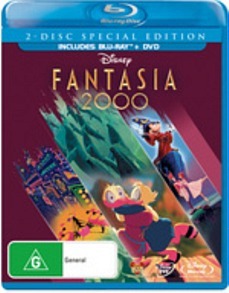 Based on the original Walt Disney classic Fantasia, Fantasia 2000 is a modern re-imagination that is considered the sequel. One interesting aspect of the 1999 version of Fantasia 2000 is that the movie is considerably shorter than the original and seems to err more on the side of caution as opposed to the almost psychedelic experience of the original. Like Fantasia, Fantasia 2000 is a collection of animated stories that are based on classical music. Not only do we see familiar characters like Donald Duck but this release contains the 2003 Academy Award nominated short called Destino that was quite the treat in its day. However for Fantasia 2000, the collection of stories take back seat as you are mesmerised by the colourful, almost 3D like animation that goes hand in hand with the soundtrack. Actors such as Quincy Jones, Steve Martin, Kathleen Battle and Ralph Grierson lend their voices to the stories and even though these are famous Hollywood stars, Fantasia 2000 was already a winner with its animation and musical score. Fantasia 2000 looks good on Blu-ray, especially its combination of hand drawn animation and CGI. Presented in an aspect ratio of 1.78:1, the colours of this film once again jump through your TV. The animation does look a little dated in some places but just like the original, Fantasia 2000 is still a Disney classic and will definitely impress the cartoon aficionados. Match that with sharp images, deep blacks and Disney should be commended on their high standard of releases for Blu-ray films. Fantasia 2000 also boasts an exceptional audio track, thanks to its 7.1 DTS-HD master audio tracks. Whether its the memorable musical score, the characters or the narration, everything is crystal clear and really makes good use of the Blu-ray technology, not to mention your surround sound speakers. It comes together quite well with the story and video, almost making it like you are part of something bigger but in actual fact, your confined to your living room. Quite an amazing experience. This release also contains a DVD Feature Film plus some entertaining special features from Musicana, Dali & Disney: A Date with Destino, the short film Destino and audio commentary with Roy E. Disney, James Levine, Don Erst and a separate commentary track by its director and art directors. Not all the features are for children however. Fantasia 2000, the reimagining of the 1940 classic Fantasia is a joy to watch. It may not be as memorable as the original film but like the first, it pushes the world of animation in classic Disney style. With an enjoyable story and acceptable video and audio quality, the only issue with Fantasia 2000 is that the CGI effects are a little dated compared to the excellent animation. Nonetheless, it's an unforgettable ride.